This month, as we celebrate Zambia’s forty eighth year of Independence, we look at another Zambian symbol – Mulungushi Rock of Authority. As a child and teenager, we often heard about Mulungushi Rock on the news, always in the context of a UNIP meeting. Not being much interested in politics, I never thought too much about it, nor did I think much of the history and what was so important about this rock. In fact my disinterest in politics was such that when plural politics returned to Zambia in 1991 and political meetings were still being held, I still did not think any further, leaving it to the politically active to ponder over it. My interest was only piqued when I started thinking about which Zambian symbol I was going to cover in this article. In 1960, the nationalists who had broken away from the Zambian African National Congress wanted to arrange a conference under the banner of the new party, the United National Independence Party (UNIP) on the direction of the party and how to achieve independence. To do this, they needed to be away from the ever-present eye of the colonial authorities, not easy for a crowd of two thousand who would be there for some days. 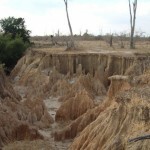 The site chosen was a rocky area close to theMulungushiRiver, north of what was then Broken Hill (now Kabwe). The river provided a good supply of water and it was felt that this was a good place for the participants to meet and to camp. The camping was not in tents, but in temporary shelters. This conference led to UNIP, under the leadership of Kenneth Kaunda, becoming the major party of independence. After 1964, Mulungushi Rock was used for UNIP party conferences and for major policy speeches such as the Mulungushi Declaration in 1968 when government declared its intention to acquire what was termed equity holdings (usually 51% or more) in a number of foreign-owned firms. These firms were to be controlled by the parastatal Industrial Development Corporation (INDECO). By the beginning of 1970, majority holdings had also been acquired in the two major foreign mining companies, Anglo American Corporation and the Rhodesia Selection Trust (RST); becoming Nchanga Consolidated Copper Mines (NCCM) and Roan Consolidated Mines (RCM) under another parastatal body, the Mining Development Corporation (MINDECO). This was followed in 1971 where control of insurance companies, building societies and some foreign banks was acquired and run under the Finance and Development Corporation (FINDECO). INDECO, MINDECO and FINDECO were brought together in 1971 under another monolithic parastatal, the Zambia Industrial and Mining Corporation (ZIMCO), creating one of the largest companies in sub-SaharanAfrica, with KK as Chairman of the Board. The nationalisation programme was closely followed in 1973 with the massive increase in the price of oil and in 1975, the halving of world copper prices. These two factors coupled with the well known and well documented inefficiencies of parastatals was the start of the downward slide ofZambia’s economic performance and by 1976Zambiahad a balance-of-payments crisis, and we very quickly became massively indebted to the International Monetary Fund (IMF). A mere ten years later,Zambiawas one of the most indebted nations in the world. But the vagaries of our economy is not the subject of this article. Today, many political meetings are still held at Mulungushi, although as far as we can understand they no longer take place at ‘The Rock’ but at the convention centre which has been built a few kilometres away, close to Mulungushi University. Reading through old press reports, it is clear that some interesting incidents have taken place at these meetings – Ministers being ‘chased’ because they were not wearing ‘third-term T-shirts’ and police confiscating a total of ninety two pistols from cadres attending a meeting. Putting aside the politics, we set off for a visit to Mulungushi Rock to see for ourselves, not knowing what to expect. A monadnock or inselberg is an isolated rock hill, knob, ridge, or small mountain that rises abruptly from a gently sloping or virtually level surrounding plain. I am not a geologist, but I would not describe what we saw as a monadnock or inselberg – it did not rise high enough like the inselbergs at Mutinondo. Instead, I would call it a granite dome or a good southern African word – a kopje. But like Mutinondo’s inselbergs, the mat-forming sedge, Coleochloa setifera, is in abundance. With the large expanse of rock and a tributary of the Mulungushi River only about half a kilometre away, one can see why it was chosen as a meeting place. Sadly on our visit there, the inevitable bush fire for this year had already swept through the surrounding bush and up parts of the rock destroying the vegetation and leaving everything blackened. But it was a pleasant day out and had we been better prepared, it would have been a pleasant place for a picnic. To get there, from the railway crossing in Kabwe (a landmark you can’t miss), proceed north along the Great North Road for 22.5 km. Turn right into the Mulungushi University premises at the second entrance (not the first one with the concrete arch). After entering the University grounds, proceed straight for 1.4 km along the tarmac road, turn left down a small dirt road for 550 metres. Turn right down another dirt road and proceed along that road for 2.3 km. At this point, if you look to your right you will see The Rock through the bush and if you follow the small dirt track to the right, it will take you to The Rock less than one hundred metres away. GPS co-ordinates are 14°17’53.46″S, 28°34’52.66″E. Having visited Mulungshi Rock, I have now sated my curiosity, but I have one remaining question. Sometime in the intervening years, the rock became known as the Mulungushi Rock of Authority. Where did the addition of the word ‘Authority’ come from?